Choosing the best productivity tool for your business can be overwhelming. Both G Suite (by Google) and Office 365 (by Microsoft) let you create documents, spreadsheets and presentations as well as collaborate on them with other members of your team. You can also video conference and get your cloud storage through either. So, which one should you choose? We’ve compared the two based on several different factors to pick a clear overall winner. The table below displays pricing for both companies as well as features included. In the end, Office 365 is less expensive for the higher tier plan, and it offers discounts for annual commitments. 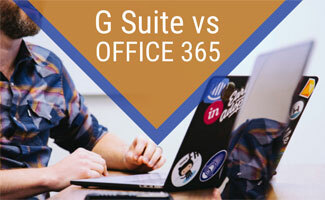 The only reason you may opt for G Suite over Office 365 is if you prefer Google applications over Microsoft’s, or if you don’t need the higher tier plan. Microsoft’s Office 365 wins this category by a hair. eDiscovery for emails, chats and files. eDiscovery is the process of searching and retrieving information in electronic format. It is useful for legal matters and prevents data loss from employee turnover. Everything in G Suite Business. G Suite’s Basic plan includes 30GB of file storage which includes emails but does not include files created with Google applications. As you move up to the Business and Enterprise plans, you get unlimited storage or 1TB per user if you have fewer than 5 users. All of Office 365’s plans include 1TB of OneDrive storage. If you plan on using basic documents and spreadsheets, 1TB will be enough storage for most small to medium sized teams. However, if you plan on working with images, videos, audio files, etc., that 1TB can get used up pretty quickly. This is why Google’s G Suite is the winner here, but only if you have more than 5 members on your team. Office 365 offers desktop and cloud-based applications. You can work offline, without an internet connection, by installing Word, Excel, Powerpoint, Outlook, etc. on your desktop. The slight downside is that Microsoft Office desktop apps must be installed locally, so someone from your team will need to know what they’re doing. If you have an IT person — perfect. If not, this may be an added cost to your organization. G Suite stores everything online, so there is no desktop version for you to work on. Its apps are also more basic than its Office equivalent. For example, there are more features and options for Excel, Word and Powerpoint than there are for Google Sheets, Google Docs and Google Slides. If you really want your team to collaborate on files, it may be easier with G Suite since the only option is to work on them online. Although you can work on files in the cloud with Office 365, users may be more likely to work on projects saved locally. However, if you express your desires to your team, we’re sure you can find a solution here, which is why this isn’t a factor in choosing our winner for this category. Below are the applications used for various tasks (the equivalent of the Google and Microsoft versions). We’ve chosen Office 365 as the winner for this category due to its online and offline work as well as its feature-rich applications. This is something the We Rock Your Web team has gone back and forth on. We’ve used both Hangouts and Skype, and in our experience, Hangouts works better. However, it’s not flawless either. Our team is small, so Hangouts offers what we need for our video conferencing. Hangouts only allows 25 participants for the Basic and Business plans or 50 for the Enterprise plan. Skype allows up to 250 participants. Our experience with Skype is that it can have a poor connection at times, making it difficult to hear others. The video can also freeze for an entire call. In the end, Skype has been more frustrating for our team to use than Hangouts. However, with Hangouts, we sometimes experience video lagging, difficulty entering team calls or audio echoes. In the end, these cons are less severe than Skype’s, so we opt for Hangouts over Skype. Unfortunately, we’re not alone in our experience with this and have read online that many others have similar issues. If you are looking to host a webinar, if you are expecting more than 24 guests, you should probably opt for Skype as part of the Office 365 suite. In the end, we’d recommend Hangouts for anyone conducting calls with fewer than 25 people. However, if you need the option for more participants, Skype is the clear pick, but you may have performance issues. By tallying up the winner counts, you’ll notice Microsoft’s Office 365 is the winner in this comparison. The only area it lacks in is file storage, but if you can handle 1TB of storage, we recommend going with Office 365. Its applications have more features at a lower price. If you need other productivity tools to help keep your team organized and communicating efficiently, check out this project management comparison article. Are you a Google or Microsoft Office fan?